When Alex Harvey died in 1982 he left behind a legacy and a passion which survives to this day – truly cult status. 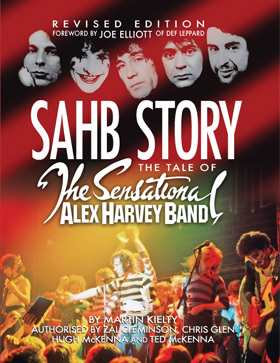 The Sensational Alex Harvey Band (SAHB) were the biggest-grossing mid-70s live act in the UK; they released eight critically-acclaimed albums in their five years together; and they inspired many of the top names in pop entertainment over the last 30 years, from AC/DC to Robert Smith to Nick Cave; from Billy Connolly to Richard O’Brien. In 1972 former teenage idol Harvey gathered with Tear Gas, Scotland’s loudest rock group, to form SAHB. As pioneers of punk, glam and performance-led rock, they caused a sensation at live gigs and became one of the strongest artistic forces in popular music at the time. followed into the 80s and beyond, after Alex died at 47. The revised edition completes the story to date with the reunion that began in 2002 featuring Billy Rankin, leading to another series of acclaimed tours and festival shows with ‘Mad’ Max Maxwell at the helm, and the release of a new live album and the band’s first-ever DVD. Meanwhile, a number of previously lost recordings featuring Harvey – notably the abandoned 1974 SAHB album – have become available. Joe Elliott of Dep Leppard, a long-time SAHB fan with scars to show for it, has contributed a passionate and heartfelt foreword. This is the only authorised biography of the band, written with the cooperation of Zal Cleminson, Chris Glen, Hugh McKenna and Ted McKenna.